What is a Custom Foot Orthoses? A custom foot orthosis is a device biomechanically designed to fit into your footwear and improve foot function. Function is improved by controlling excessive or unnecessary motion while standing, walking or running. 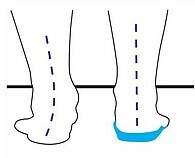 In addition to controlling abnormal foot function, custom foot orthoses can accommodate painful areas of the foot. They can provide stability for the foot and correct injury-causing imbalances. This may result in a dramatic decreases of painful symptoms and increased comfort. Foot orthosis can help to halt the progression of existing problems and allow healing to occur. Foot orthotics can help in alleviating pain in your hips, knees, shins, arches or metatarsal bones. Whether you are interested in increasing daily comfort or an athlete looking to optimize performance, most everyone can benefit from some type of foot orthosis. One of the foot’s main functions is to absorb shock as the body’s weight shifts with each step. This is accomplished through a complex process in which the arch of the foot flattens slightly. The controlled flattening of the arch aides in absorption and distribution of our body’s weight through the entire surface of the foot. There are two main types of custom foot orthoses; accommodative orthoses and functional foot orthoses. Both types of custom foot orthoses are used to correct and align the foot of the patient so that the pain in their foot or lower extremity will improve and the normal activities can be resumed with little to no pain. These orthoses are used primarily to cushion, pad or relieve pressure from a painful or injured areas on the bottom of the foot. Patients who benefit from accommodative foot orthotics often suffer from diabetes, neuropathy or arthritis. These orthoses may be made of a wide range of materials such as cork, leather, plastic foams, and rubber materials. They are generally more flexible and soft than a functional foot orthoses. Functional foot orthoses are useful in the treating a variety of painful conditions of the foot and lower extremities. These ailments include: arch and instep pain, ankle pain, heel pain and biomechanical alignment inconsistencies of the knee, hip or back. Each, is commonly treated with functional foot orthoses. The advantages of functional foot orthoses are that they are relatively durable, infrequently require adjustments and lower in profile. Functional foot orthoses may be made of flexible, semi-rigid plastic, rigid plastic or graphite materials. They are relatively thin and easily fit into most types of shoes. They are fabricated from a three dimensional model of the foot which can be made by taking a plaster mold of the foot or stepping into a compressible foam box. A prescription from a podiatrist or a physician is generally required for the services and to bill your insurance. Last, but not least, our devices are made in house, we do not send your molds offsite to be made by another manufacturer.